This correspondence and financial documents are from the records of the Anti-Saloon League of Kansas. 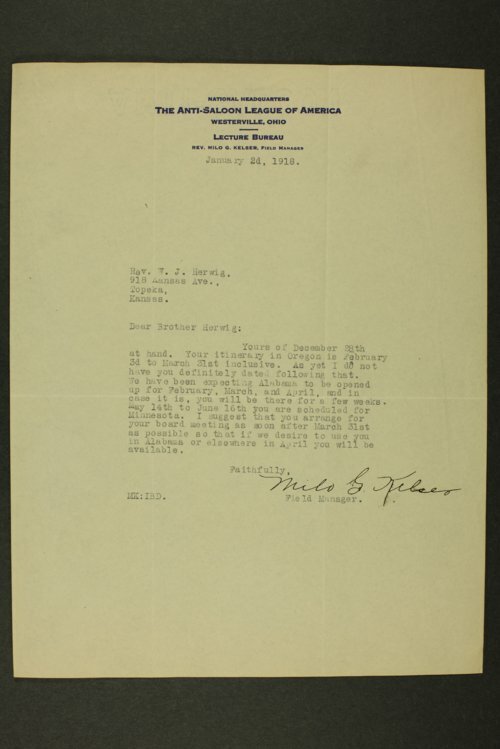 The majority of the letters are exchanged between Milo G. Kelser, field manager for the Anti-Saloon League of America located in Westerville, Ohio, and Rev. W. H. Herwig, superintendent of the Anti-Saloon League of Kansas. Other correspondents include Boyd P. Doty, assistant financial secretary for the Anti-Saloon League of America, H. T. Laughbaum, superintendent of the Anti-Saloon League of America, and Miss Nettie F. Corning, secretary for the Anti-Saloon League of Kansas.